For the first time since the preseason, the Massachusetts men’s lacrosse team is back in the NCAA Division I men’s lacrosse rankings, rounding out the polls at No. 20 in NCAA.com’s most recent evaluation. 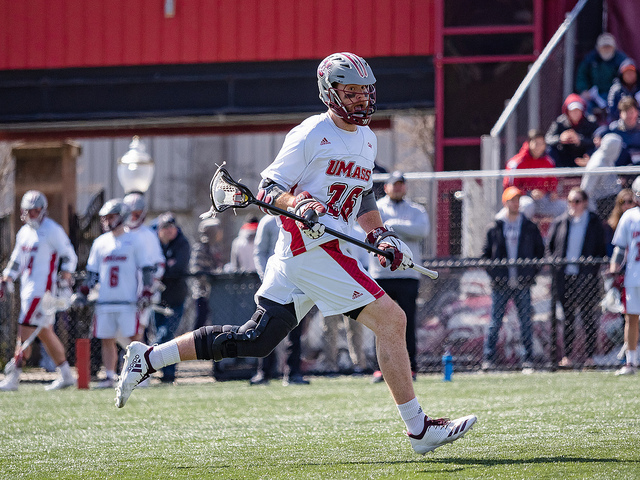 UMass has rattled off four straight wins to climb back in, and with the way senior Isaac Paparo has been playing, that streak figures to extend this weekend when the Minutemen host Brown. Against Utah on Sunday, Paparo turned in what was arguably his best performance of the year on paper: four caused turnovers, seven ground balls and an assist in the 16-2 victory. He registered no goals but was not afraid to let the ball fly, firing off three shots to establish the Minutemen’s transition game. Paparo’s Utah game followed up a five-shot, two-goal effort against UMass Lowell. Led by Paparo, the defensive unit has given little ground in each of the past two games, surrendering four goals to UMass Lowell before allowing just two to Utah. Part of that has been Tom Meyers controlling possession for the Minutemen with his face-off dominance, and part of that has been the off-ball defense, which Cannella cited as an area needing improvement when the team headed into its Albany matchup four weeks ago. The chemistry between Paparo and the rest of the defensive unit, plus Paparo’s placement all over the field, has been foundational to his recent production, as well. For a close defenseman, Paparo is unusually short in stature, standing just five-foot-seven. Meanwhile, every other close defenseman on the roster is six feet or taller, with Jackson Suboch standing six-foot-five and Duke Lenaghan a towering six-foot-six. For his “whole life,” Paparo has played with a chip on his shoulder because of his lack of height. “So, that’s what I still do,” he added with a laugh. Face off is schedule for 1 p.m. at Garber Field on Saturday.